October is in full session. The ocean is buzzing with large billfish. And the Cabo San Lucas marina is full of boats hoping for a chance to catch that million dollar fish. It’s Bisbee’s time and everyone is hoping for that perfect marlin. The Bisbee’s Black and Blue Tournament is one of the top tournaments for marlin fishers in Cabo San Lucas. 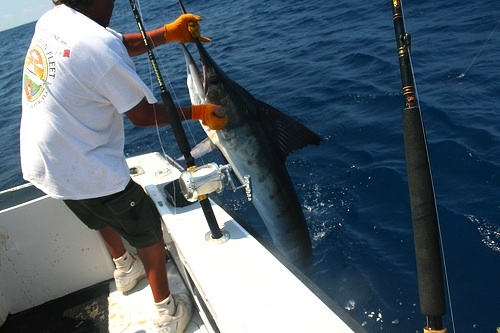 Cabo San Lucas is home to 3 different types of marlin: Blue, Black and Striped. In 2008, the Get Over It caught 197 marlin in one day 50 miles off shore of Cabo. This beat out the previous record of 190 marlin in a day caught by the Reelaxe in 2007. October is the month with the most fishing tournaments in Cabo San Lucas – the Los Cabos Billfish Tournament, Bisbee’s Los Cabos Off Shore Tournament, Bisbee’s Black and Blue Marlin Tournament, and the Puerto Los Cabos World Cup. The Bisbee’s Black and Blue Marlin Tournament is the richest fishing tournament with over $3,000,000 in prizes. Los Cabos is the Striped Marlin capital of the world, with more striped marlin found in the Cabo waters than anywhere else. What is your favorite Cabo San Lucas marlin story?